Knitting a ribbed sock adds a bit of interest from just a plain stockinette stitch sock. Ribbing can be done in many combinations….whatever suits you….3 x 3, 3 x 2, 3 x 1, 4 x 2. I’ve added a round toe for something a bit different. Again, you can choose any type of toe finish you desire as well as a heel length that suits your heel. For a size 9 women’s (Australia) size I would increase the needle size to 2.75mm and knit at least another 5 rows for the foot section. It is best for you to slip on the sock as you get closer to the toe section which will give you an idea if you’re on track. 30.0 sts = 4 inches (as per the yarn band). I’m a bit naughty and don’t generally knit tension/gauge squares. It’s always hit and miss for me….luckily most times it works out. Cast 64 sts onto a single needle and then proceed in cuff pattern knitting 16 sts onto four needles. You should now have a total of 16 sts on each of four needles = 64 sts. This section is worked back and forth. Repeat Rows 2 and 3 11 more times (12 times total). RS is facing for next row. Repeat last two rows until all sts have been worked. There should be 13 sts remaining and the RS is facing. 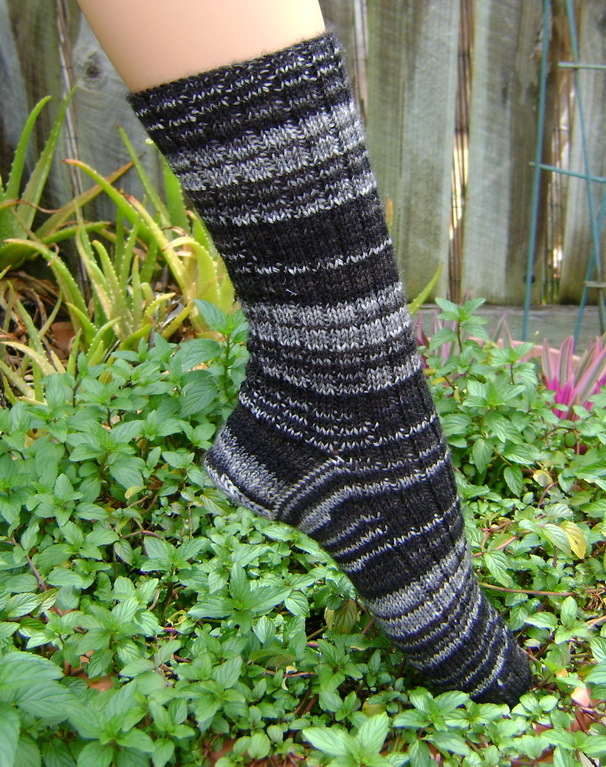 Knit across 13 heel sts. Using that same needle, pick up and knit 17 sts along selvedge edge at side of heel flap, using the slipped sts as a guide. With a new needle (if you placed the sts on a holder, otherwise the next two needles), work in 3 x 1 rib pattern across the 33 sts of the instep. Using the fourth needle, pick up and knit 17 sts along the selvedge edge at the other side of the heel flap, using slipped sts as a guide. Knit 7 sts from the first needle onto Needle 4. You should now be at the centre of the heel. It’s an idea to place a clip on marker here. There should be 23 sts on Needle 1, 33 sts across Needles 3 and 4 and 24 sts on Needle 4 – 80 sts in total. From now on the 33 sts instep sts on Needles 3 and 4 will be worked in the 3 x 1 rib pattern, and the gusset and sole will be worked in stocking stitch. Set up round. I always like to prepare the first round in this fashion as it makes the first round of sts sit nice and firmly ready for the decreases. Repeat these rounds until there are 64 sts remaining across all four dpns, ie 15 sts on Needle 1, 33 sts on Needles 2 and 3 and 16 sts on Needle 4. Rearrange sts so there are exactly 16 sts on EACH needle. That should just be a matter of slipping the first st from Needle 2 onto the end of Needle 1. From here on you will only be using stocking stitch, ie each row knit. At the end of Row 21 knit the 4 sts from Needle 1 onto Needle 4 – you will now have 8 sts on Needle 4. Slip the 4 sts from Needle 2 onto Needle 3. You should now have 8 sts remaining on each needle. 16 sts in total. Graft these stitches together and weave in ends. If you find any errors please leave a comment so I can rectify.